The Hermit Thrush Catharus guttatus has a more distinct chestnut colour on the upper tail than Bicknell’s Thrush, as well as more blackish spotting on the breast. The Swainson’s Thrush Catharus ustulatus has a fairly obvious buff eye ring, and its upper tail feathers show no chestnut coloration. The Veery Thrush Catharus fuscescens has a rich reddish-brown on its back and tail and brownish spotting on the chest. 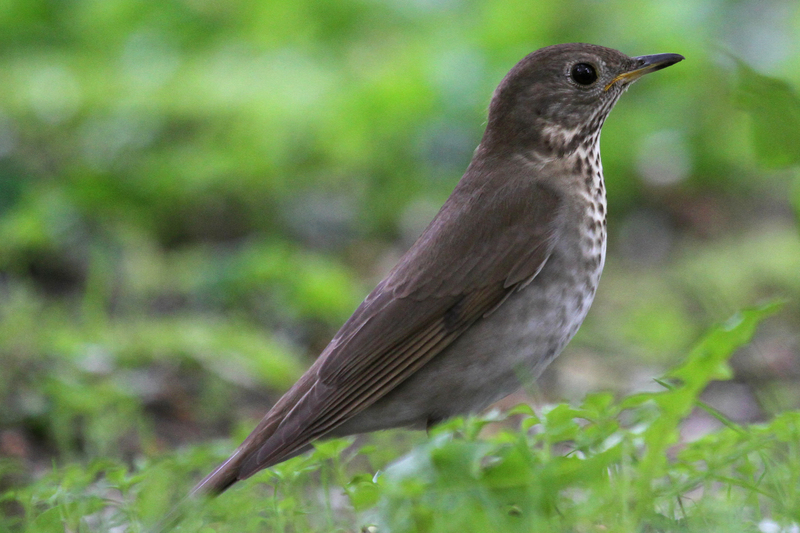 Like the other Catharus thrushes, Bicknell’s Thrush sings with a spiralling, flute-like whistle. Perhaps not as beautiful as the Hermit’s or as prolific as the Swainson’s, the Bicknell’s song is nevertheless a sound like no other. Sung mainly by the male, the song has been described as a chook-chook, wee-o, wee-o, wee-o-ti-t-ter-ee. Although there is considerable variation among regions and individuals, the downward-spiralling song almost always ends with a strong, rising inflection. Several different call notes have been observed and recorded and have been described as beer, veer, beeeaa and queep. 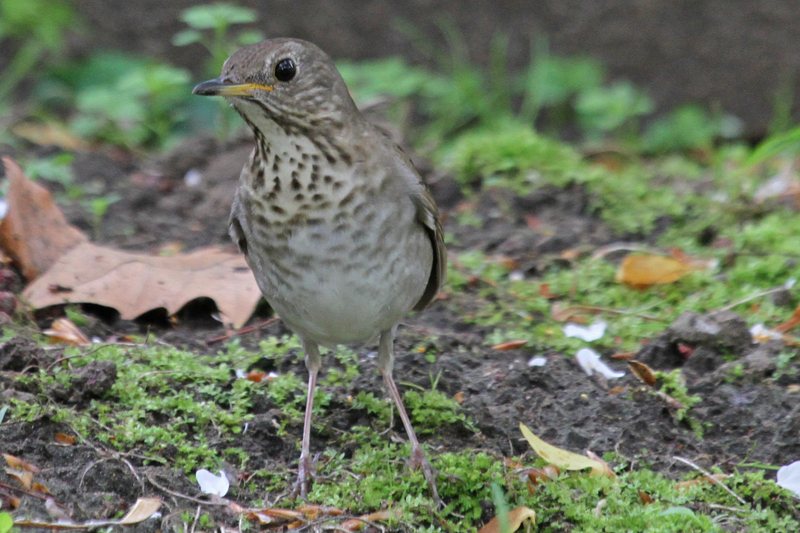 Under stress, Bicknell’s Thrush may also “mute” or whisper its song, sounding like it is much farther away than it is. 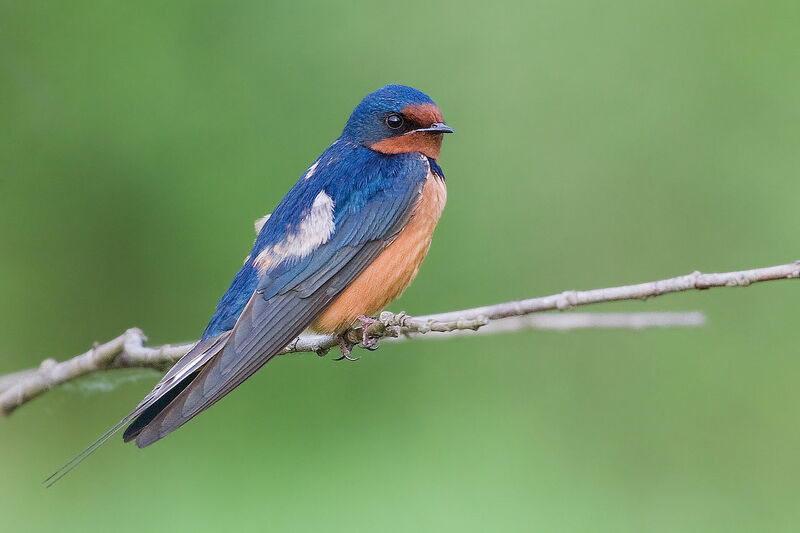 These birds also are known to sing songs while flying on the breeding grounds and to utter flight calls during their nighttime migrations. On the wintering grounds, Bicknell’s Thrushes are known to call and, very infrequently, sing. 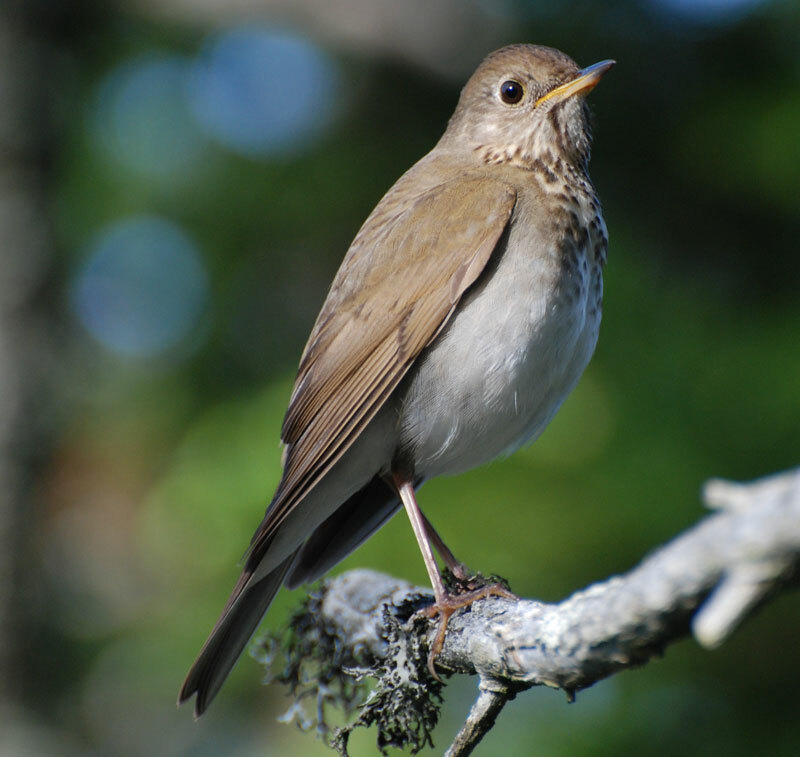 Bicknell’s Thrush breeds in two types of habitats: those undisturbed by humans and those transformed by commercial forestry activities. 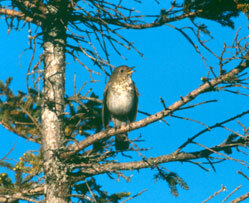 In the former, Bicknell’s Thrushes make their home in mountainous forests of fir and spruce. They favour areas where there is vigorous new growth and exposed mountains and plateaus where the trees are stunted, windblown, and often shrouded in fog. These habitats usually contain dead standing trees or “snags.” Bicknell’s Thrushes are also found on exposed mountain ridgelines where the stunted and windblown vegetation separates the barren rock above from the forests below. While the birds gravitate towards the mountaintops, it is not the elevation in itself that draws them there; in addition to suitable vegetation, it’s the cool, damp climate. 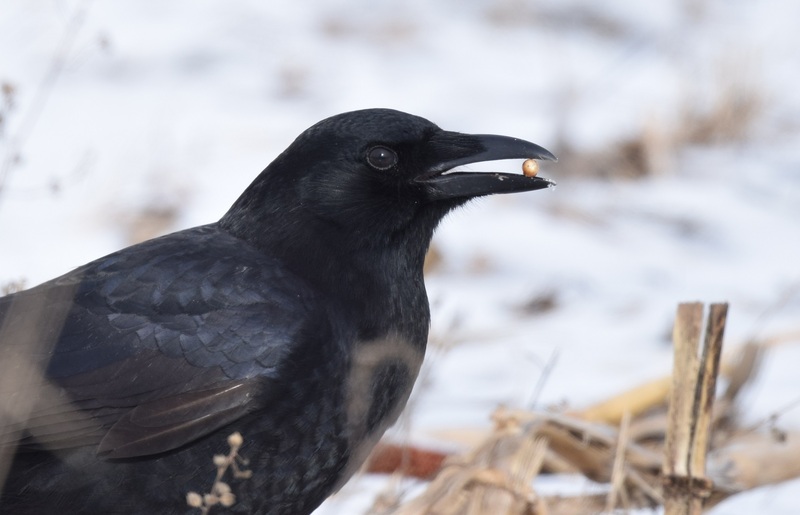 Scientists believe this because the birds also frequent lower habitats off the shores of Cape Breton Island on St. Paul and Scaterie islands, as well as other low-lying coastal localities with climates and forests similar to the birds’ mountaintop habitats. 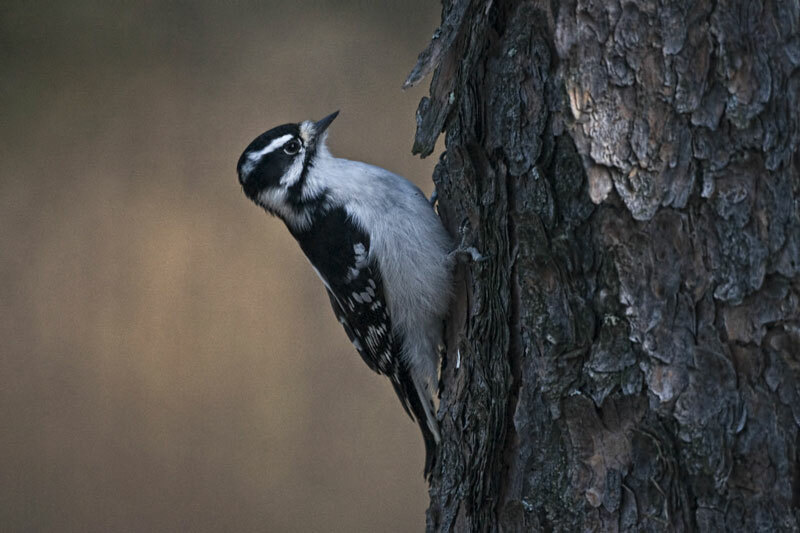 Scientists observed the birds’ acceptance of industrial forest habitats, where trees are at various stages of growth, relatively recently. 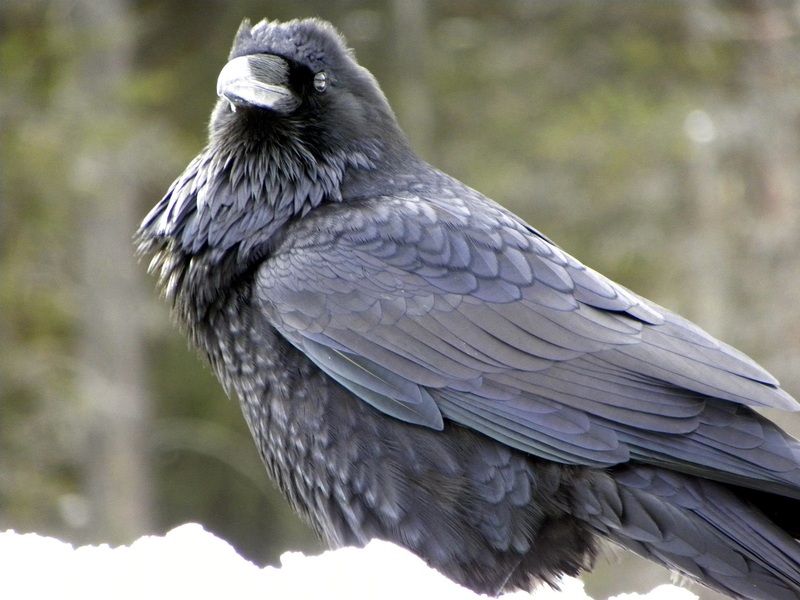 The birds can be found scattered throughout the highland industrial forests of northern New Brunswick, Cape Breton, Quebec, and, perhaps, Maine. 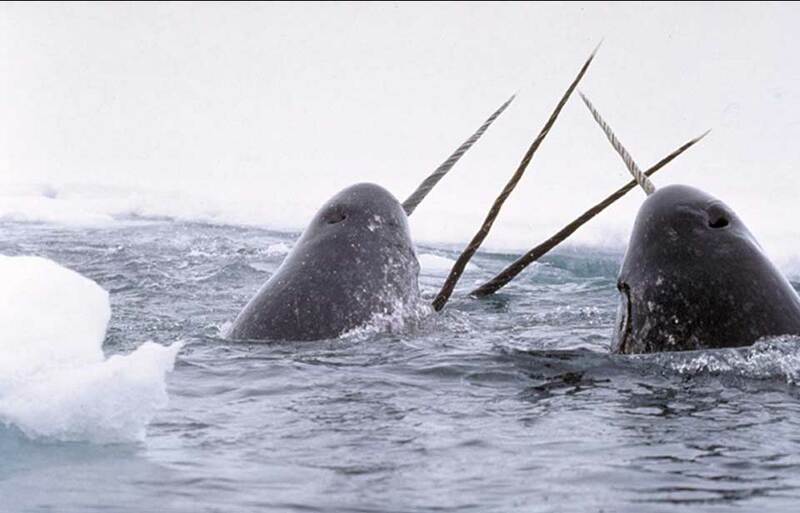 They prefer very dense, regenerating spruce and fir that are between 2 and 8 m high. Because these habitats are rapidly growing and changing, they may be suitable as Bicknell’s Thrush habitat for only five or 10 years. On the wintering grounds in the Greater Antilles, Bicknell’s Thrushes live mainly in broadleaf mountain forests and mostly in habitats above 1 000 m. While some of these areas remain undisturbed, most have been changed to allow agricultural development to take place, particularly at lower elevations. Bicknell’s Thrushes have an unusual mating system in which females mate with more than one male. Such a mating practice is not known to occur in other thrushes. As many as four males perform duties connected with one nest, including bringing food for the nestlings. The entire breeding population of Bicknell’s Thrush is restricted to northeastern North America, a claim that can be made for no other living bird species. The range is small, bounded by New York to the south and Cape Breton and southeastern Quebec to the north. Except for a few offshore islands and coastal sites, Bicknell’s Thrush occupies mostly the highest elevations in the areas it inhabits along the Appalachian mountain range. This includes, in the Maritime provinces, the Cape Breton Highlands and north central and northwestern New Brunswick. In Quebec, Bicknell’s Thrush habitat is found in the Gaspé Peninsula highlands, the Mégantic and Gosford mountains in the extreme southeastern corner of the province, the Laurentian Wildlife Reserve region and a few other scattered localities on the north shore of the St. Lawrence River, and on Monts Valin north of the Saguenay River. In the United States, this thrush is found mainly in the Catskill Mountains of New York, the Green Mountains of Vermont, the White Mountains of New Hampshire, and the mountains of western and central Maine. The wintering range is even more restricted. Known populations are located in the Greater Antilles, mainly in the Dominican Republic and Cuba, with smaller numbers in Jamaica, Puerto Rico, and Haiti. 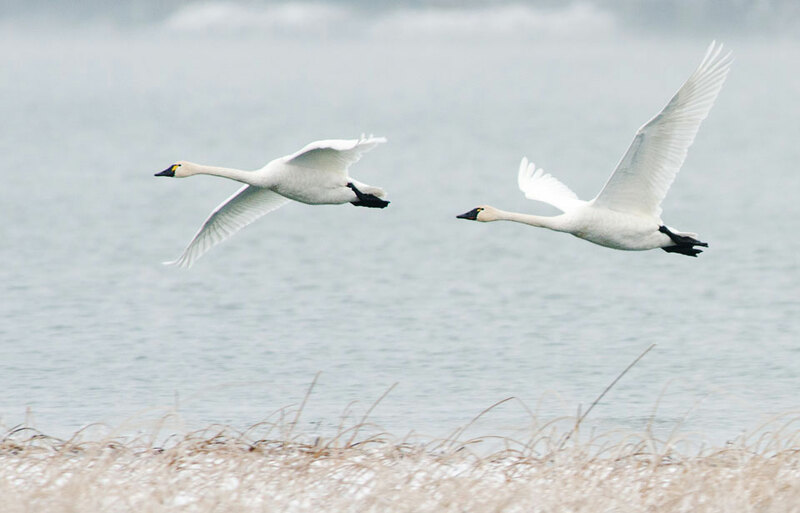 Very little is known about the migratory route between the breeding and wintering grounds. 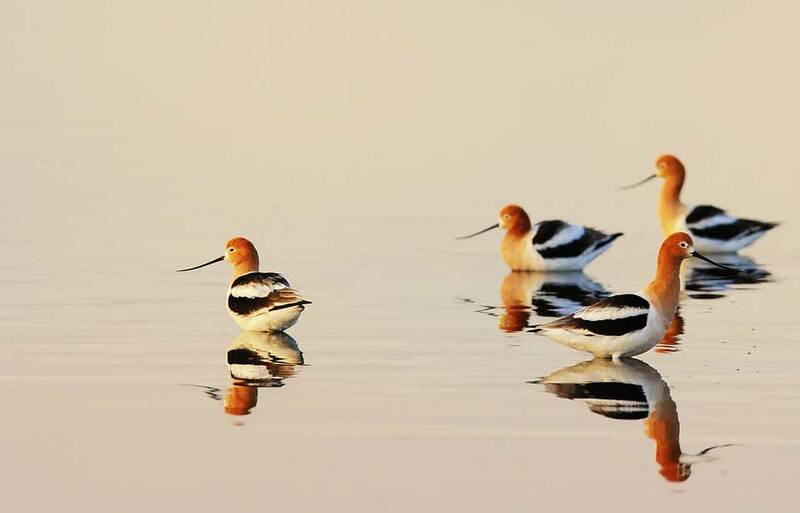 However, records indicate that in the fall, the birds begin their migration in late September and use an overland route east of the Appalachian Mountains as far south as Virginia, then fly over water to the Greater Antilles. 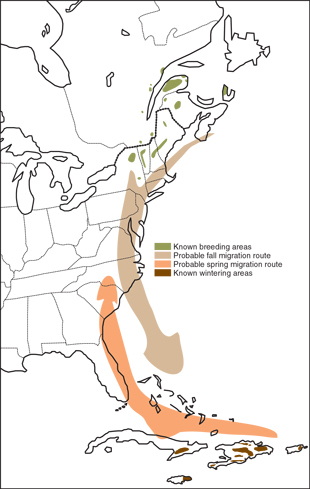 Spring records in the southeastern United States suggest that on their northward flight, which begins in April, some Bicknell’s Thrushes may skirt Florida, but most of them fly from the Greater Antilles over water to Maryland and the New England states and then make their way to the breeding grounds over land. Bicknell’s Thrush feeds mainly on beetles, ants, caterpillars, and spiders. A bird that primarily finds its food on the ground, this thrush also catches flies and gleans insects from the foliage of trees. 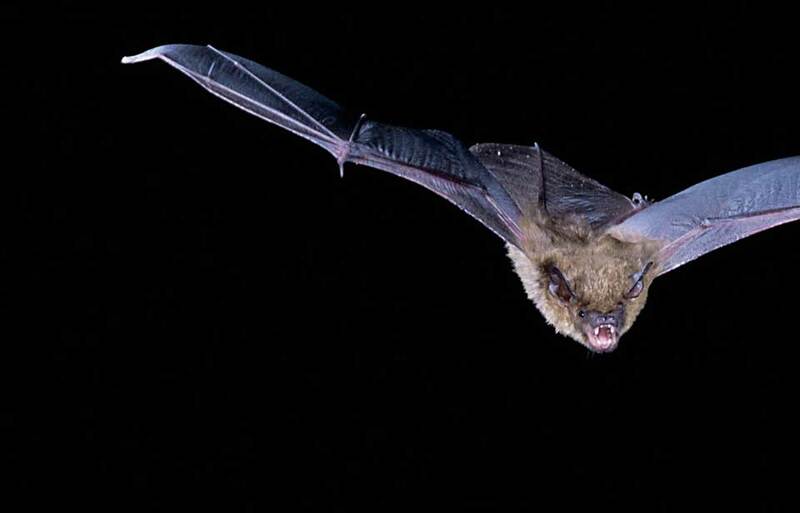 It adds wild fruit to its diet in late summer, during migration, and on the wintering grounds. 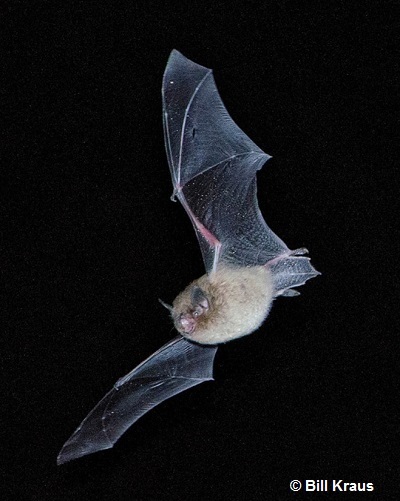 The mode of foraging, or searching for food, is to move quickly either by hopping or by making short flights between low branches or on the ground beneath the trees. It appears that adult Bicknell’s Thrushes return year after year to the same area to breed. 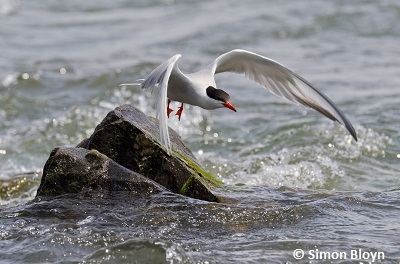 Scientists believe that younger birds, however, return to the same general region but not the same specific area. Breeding home range size varies considerably, and may be as little as 4 ha or as much as 80 ha, depending on local circumstances. Home ranges that are beside each other usually overlap. Bicknell’s Thrushes breed when they are one year old. 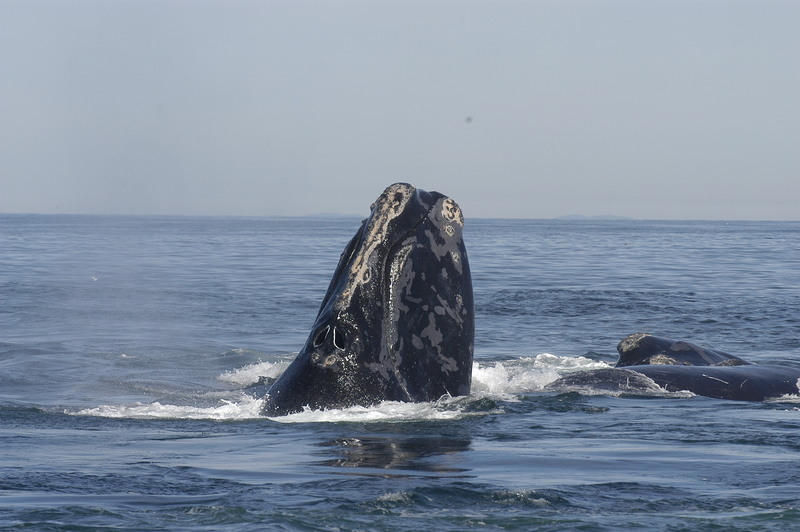 The males arrive at the breeding grounds in mid-to-late May, usually a few days before the females. 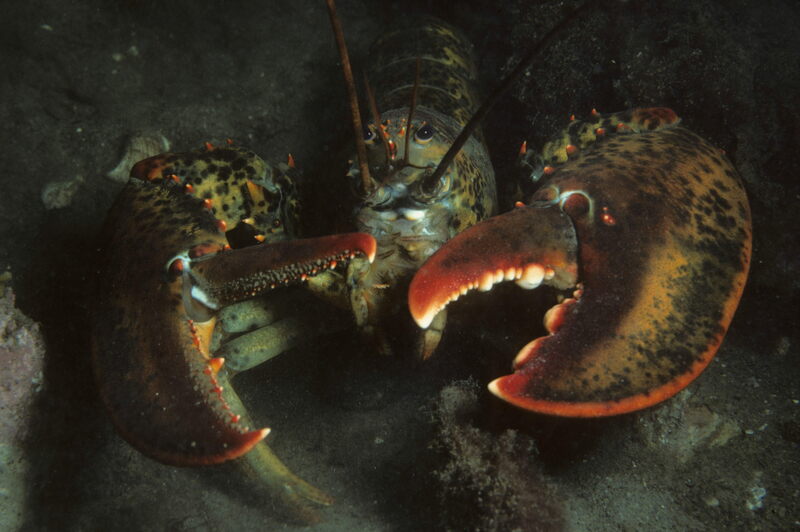 Shortly after reaching the breeding grounds, the male heralds the mating season by singing throughout the day to signal his availability to arriving females. If cold weather persists, singing may become intermittent until the weather improves. Soon after mating begins, a nest site is selected, probably by the female. The birds begin building the nest in early to mid-June. It is bulky, cup-shaped, about 12 cm across, and is built primarily from twigs and moss and lined with materials such as thread-like fungus, grasses, dry leaves, bark strips, animal hair, and lichen. The nest is usually located in a dense stand of young spruce or fir, at the base of horizontal branches against the trunks of the small trees. 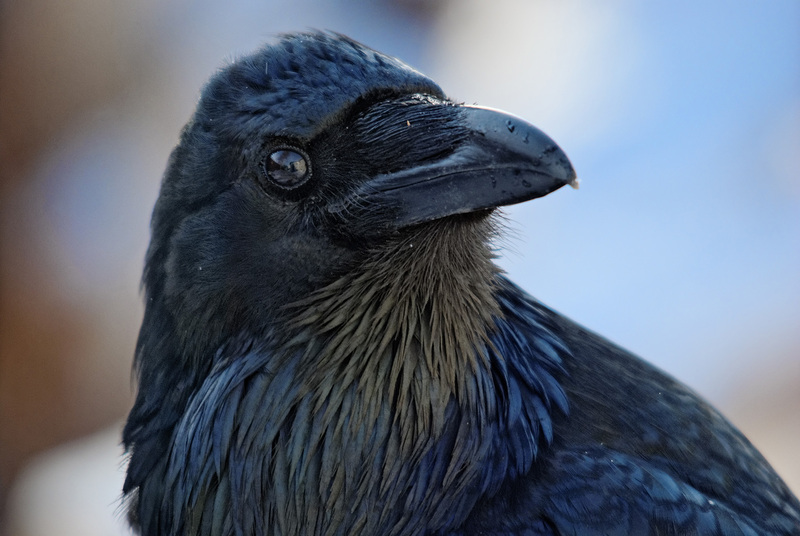 The birds normally take a week to 10 days to build the nest, but, if necessary because of destruction by a predator or accident, the nest can be rebuilt in as few as two days. The female lays one egg a day, usually in the early morning hours. 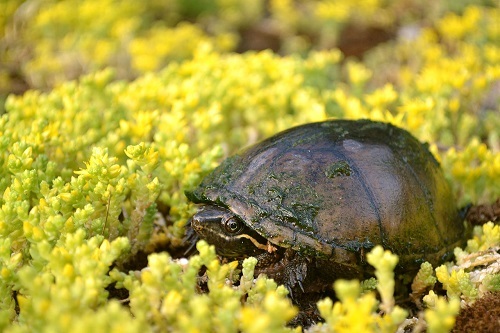 The eggs are generally bluish-green with light brown speckles, and the size of the clutch, or set of eggs, is three or four. A second brood is rare, but a replacement clutch is normal if the first is lost early in the season. 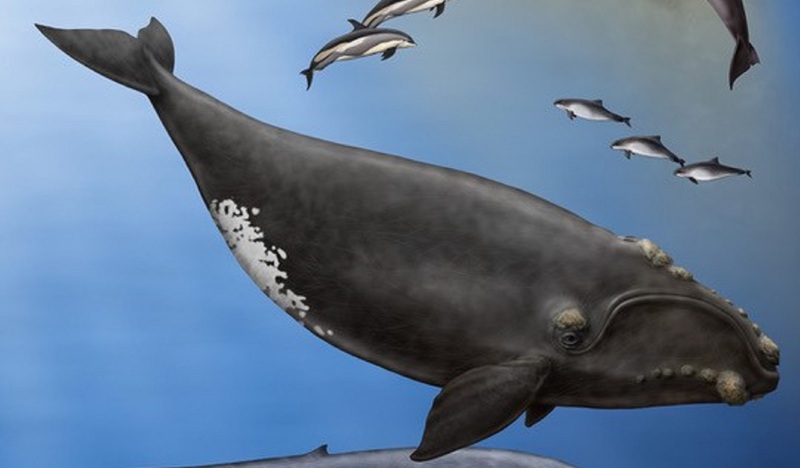 The female begins incubating, or warming, the eggs, after she lays the second-last egg. 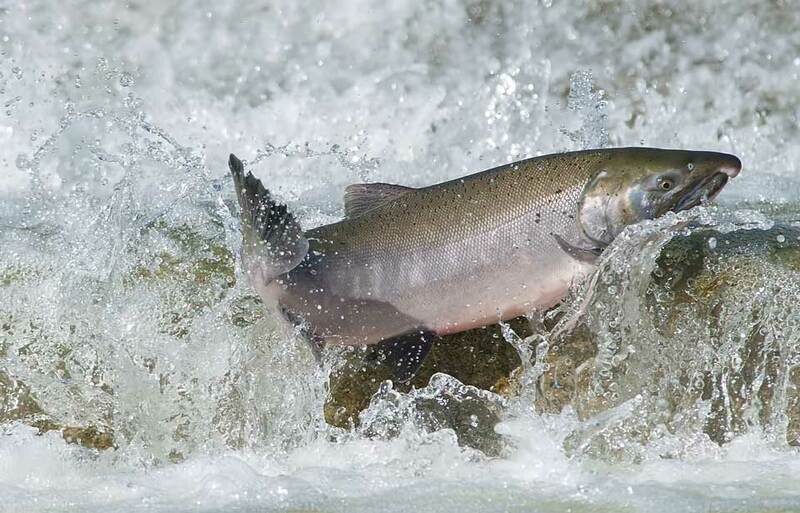 Incubation is done entirely by the female. The young hatch after about 12 days. 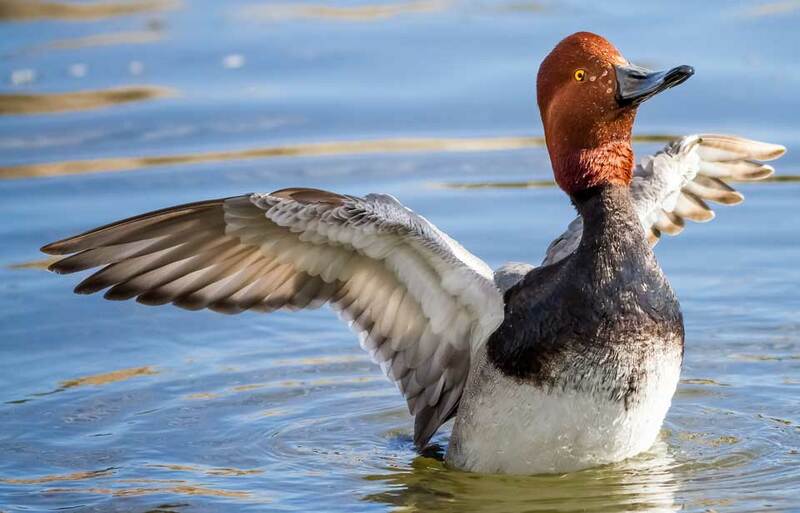 They are without feathers and are completely dependent on the adults for food and warmth. As with most songbirds, Bicknell’s Thrush nestlings grow rapidly, developing in 12 days from peanut-sized hatchlings to completely feathered adult-sized birds. At this age, they fledge from the nest, ready to fly and no longer able to fit in their small home. Young fledged birds remain in the general area of the nest while the adults continue to care for them. 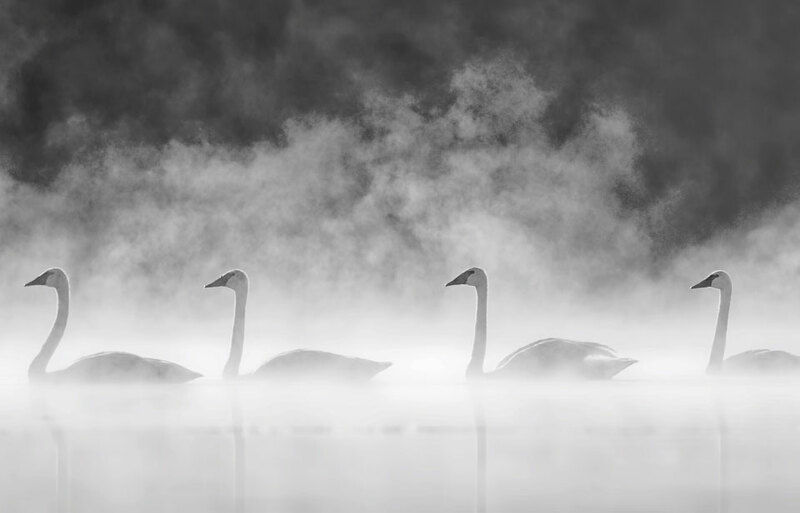 By the fall migration in September, they are independent. On average, each nest produces only one or two fledgings, and in years when the species’ main predator, the red squirrel, is abundant, even fewer young birds survive. Information on the number of Bicknell’s Thrushes is very poor. There are several reasons for this. First, most estimates are based on classic models of territoriality, where each singing male is counted as a pair. However, since the mating system of Bicknell’s Thrush involves up to four males at each nest, this method may not produce accurate numbers. Second, because males do not defend territories, their home ranges in a given sector often overlap, complicating efforts to estimate the number of birds in an area. Finally, Bicknell’s Thrushes are not evenly distributed within their habitat. Based on the limited knowledge about the birds, scientists calculate the total number of Bicknell’s Thrushes at well below 50 000. 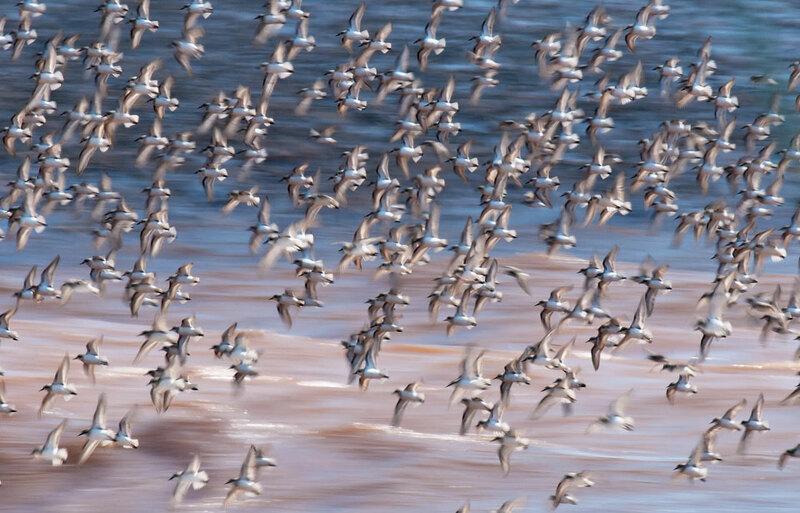 In Canada, 4 000 to 15 000 birds is a realistic estimate, with the birds fairly evenly split between the Maritimes and southeastern Quebec. 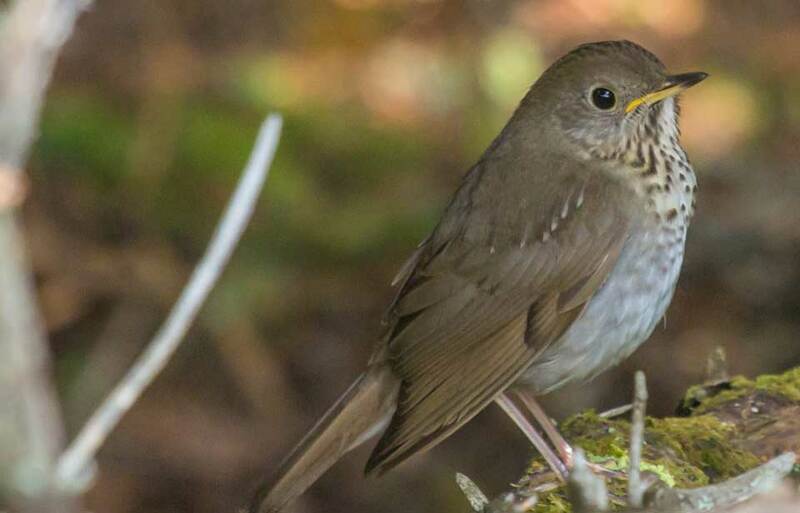 Habitat degradation is posing a considerable threat to the breeding habitats of Bicknell’s Thrush. 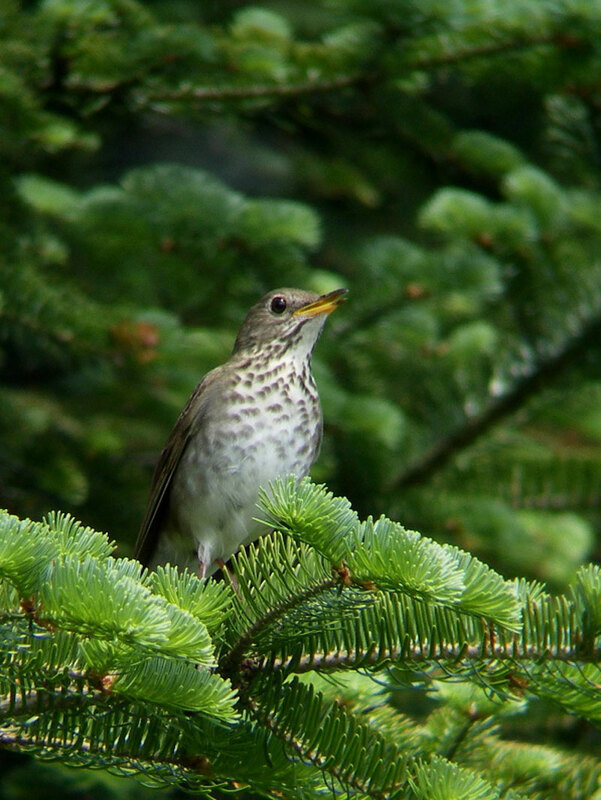 Scientists believe that industrial pollution is one of the main reasons for the decline of the red spruce, an important element in Bicknell’s Thrush habitat in the United States. 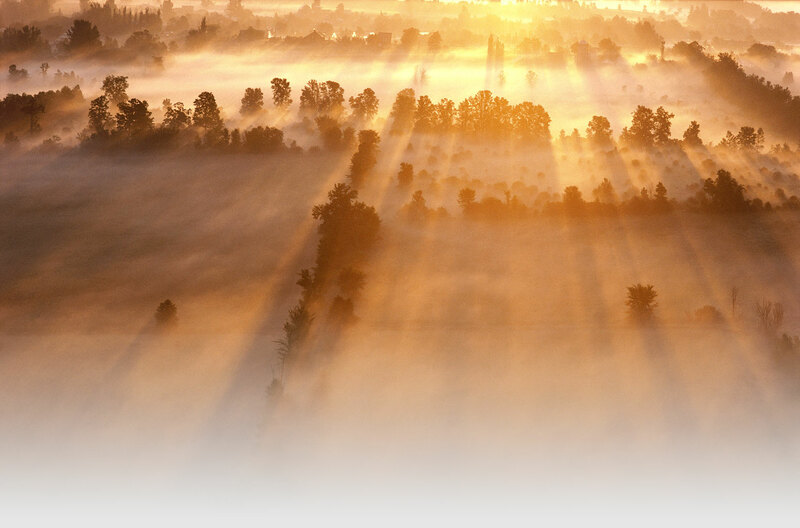 They also think that airborne heavy metals have damaged high-elevation forests in the northeastern United States. Furthermore, based on expected substantial carbon dioxide increases by the end of the century, scientists predict a radical reduction of balsam fir forest in the eastern United States. 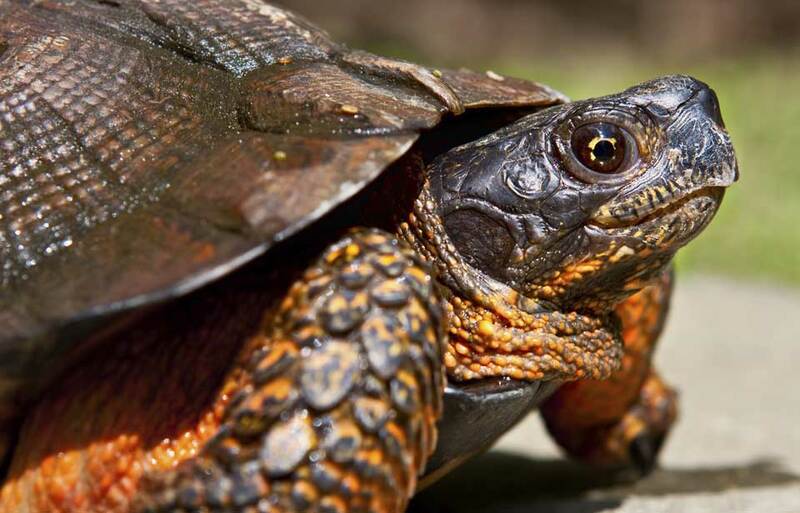 Global climate change might be an even more significant force for long-term habitat degradation. If average global temperatures increase and forests change as much as predicted, Bicknell’s Thrush habitat is very likely to be altered in ways that may seriously affect the species’ survival. 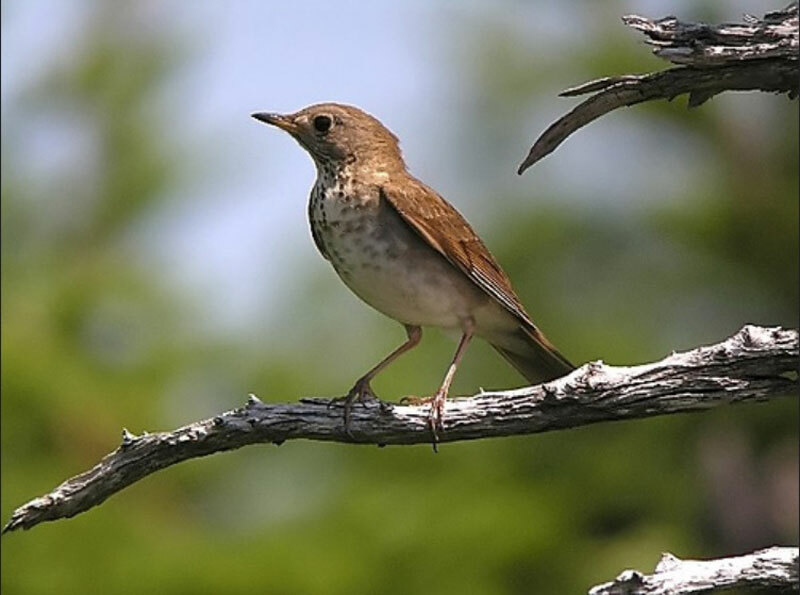 Other known potential threats to Bicknell’s Thrush habitat are the development of recreational skiing and summer sports areas, increasing numbers of telecommunications towers on mountaintops, cyclical spruce budworm outbreaks, and commercial forestry operations. If they are modified, industrial forestry practices, although possibly harmful, may aid in conservation efforts to protect Bicknell’s Thrush. 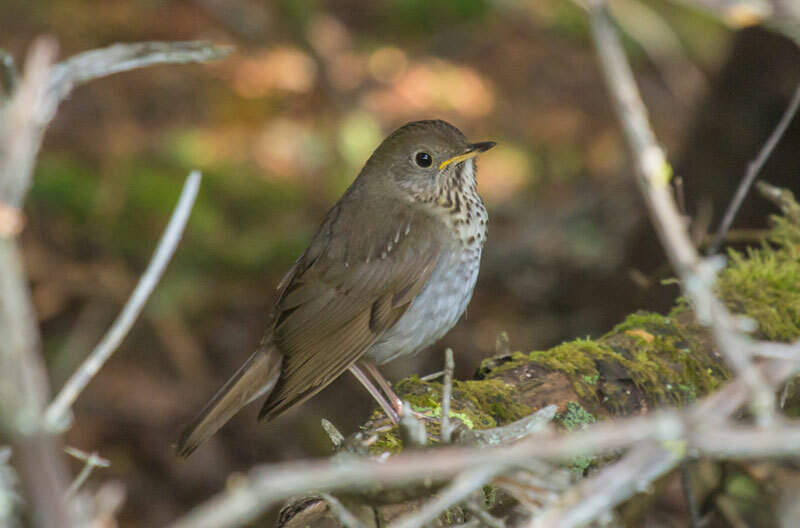 While much more study is needed, the bird’s apparent acceptance of certain commercial second-growth forest gives promise to possibilities of “growing” Bicknell’s Thrush habitats in the future. There is also considerable concern about the degradation of Bicknell’s Thrush’s wintering habitats. The Dominican Republic’s native forests are under considerable pressure from naturally occurring events such as hurricanes, as well as changes for agricultural activities, particularly at low altitudes. The forested lands of Haiti have been almost completely eliminated. In Cuba, most of the known suitable habitat exists in protected parklands. Ticks, blow flies, and lice are some of the known parasites with which Bicknell’s Thrush must contend. 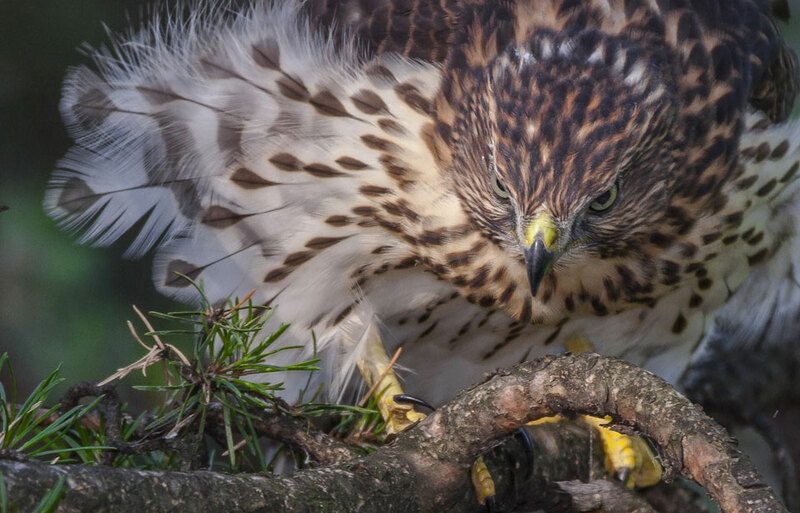 Predators include the Sharp-shinned Hawk, the long-tailed weasel, and the Northern Saw-whet Owl. Perhaps the most important predator, however, is the red squirrel, the main confirmed predator of eggs and nestlings in breeding ecology studies. In years when red squirrel populations are high, the reproductive success of Bicknell’s Thrush declines. Fragmented habitat caused by commercial development is thought to allow the red squirrel to infiltrate the breeding sites of Bicknell’s Thrushes. Bicknell’s Thrush is listed by the Committee on the Status of Endangered Wildlife in Canada and the Province of Nova Scotia as a Species of Special Concern, meaning that it has characteristics that make it particularly sensitive to human activities or natural events. 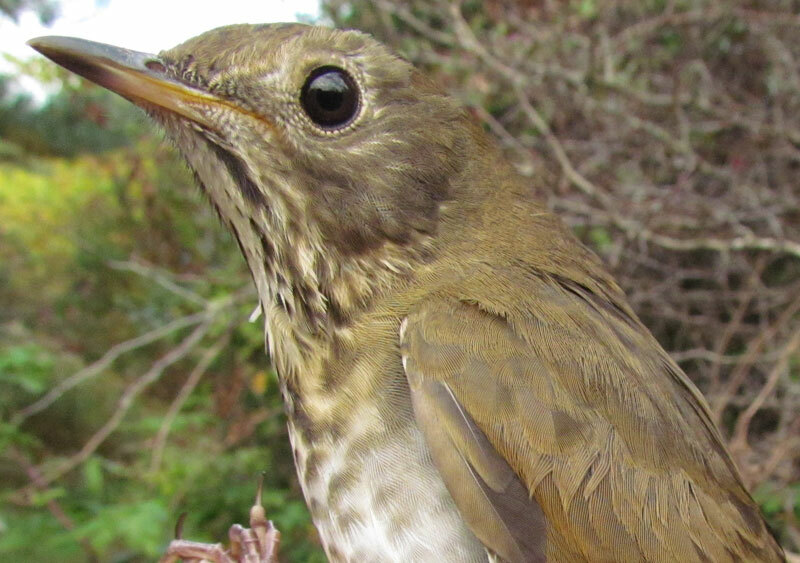 In the United States, Bicknell’s Thrush has been cited as a top priority bird species for conservation concern in the northeastern United States Partners in Flight initiative, a program coordinated by government and nongovernment groups to conserve landbirds. Much remains to be discovered about this mysterious bird. 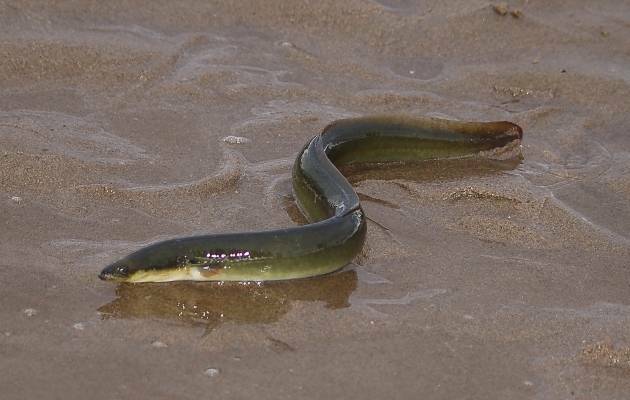 Its recent designation as a species, its affinity for remote and inhospitable habitats, and its relative rarity are factors that help explain why our store of knowledge is still limited. Almost nothing is known about the size of the population over the years or possible recent declines. What is known is that Bicknell’s Thrush is no longer found in some areas where it was once common. 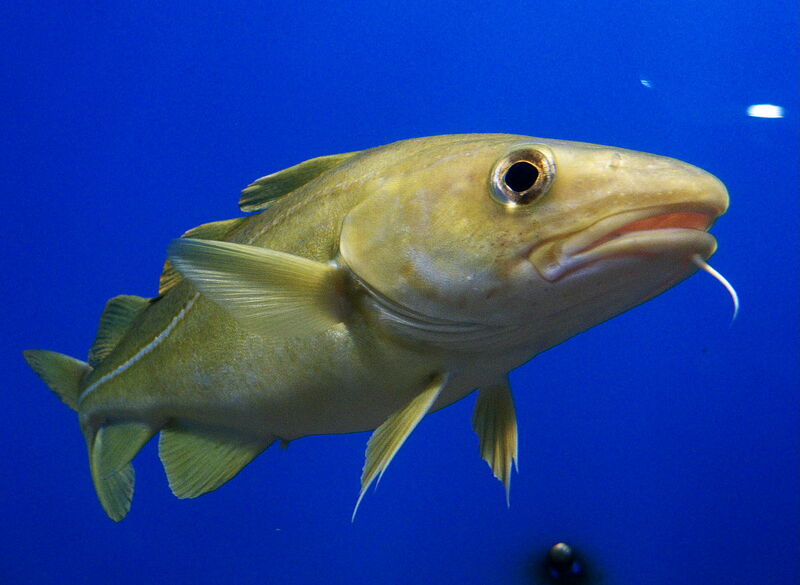 Research and population monitoring are needed before comprehensive management and conservation plans can be implemented. Erskine, A.J. 1992. 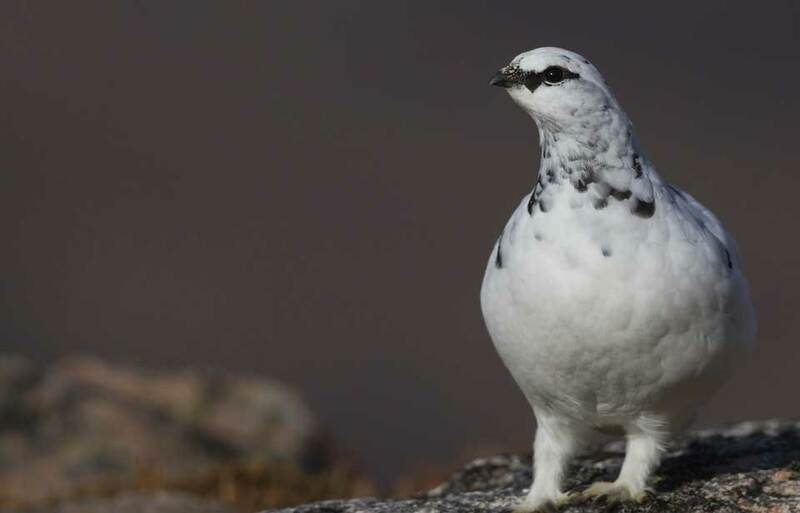 Atlas of breeding birds of the Maritime Provinces. Nimbus Publishing Limited and the Nova Scotia Museum, Halifax. Ouellet, H. 1996. Bicknell’s Thrush. In The breeding birds of Québec: Atlas of the breeding birds of southern Québec. J. Gauthier, and Y. Aubry, editors. Association québécoise des groupes d’ornithologues, Province of Quebec Society for the Protection of Birds, Canadian Wildlife Service, Environment Canada, Québec Region, Montréal. Ouellet, H. 1993. Bicknell’s Thrush: taxonomic status and distribution. Wilson Bulletin 105: 545–572. Rimmer, C. C., K. P. McFarland, W. G. Ellison, and J. E. Goetz. 2001. Bicknell’s Thrush (Catharus bicknelli). In The Birds of North America, no. 592. A. Poole and F. Gill, editors. The Birds of North America, Inc., Philadelphia, Pennsylvania. Tufts, R.W. 1986. 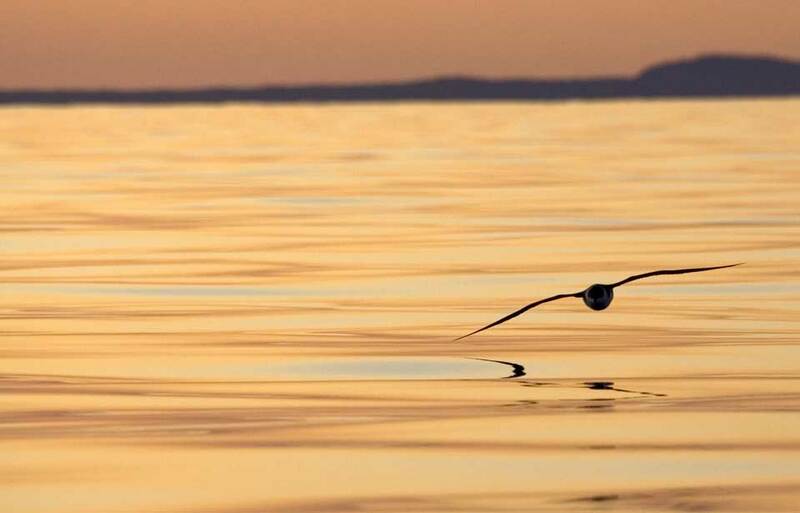 Birds of Nova Scotia. Third edition. Nimbus Publishing Limited and The Nova Scotia Museum, Halifax. Wallace, G.J. 1939. Bicknell’s Thrush, its taxonomy, distribution, and life history. Proceedings of the Boston Society of Natural History 41: 211–402.